A recent rant on Craig's list by a popular New York City restaurant illustrates the dramatic way consumer's are changing. The story starts with a restaurant that noticed an increase in customer complaints on review sites related to slow service and long table wait times. A consulting group was called in that quickly blamed the wait and kitchen staff for slow service and inefficiency. Luckily, the same restaurant had some video surveillance footage from July 2004. They then compared the footage to digital video taken in July 2014. The date selected for comparison had roughly the same number of customers (45) to keep comparisons simple. Customers walk in and are seated with menus. 3 request a new table. Customers order in 8 minutes. Appetizers are served in 6 minutes. Waiters are attentive and professional. Customers leave 5 minutes after receiving check. 18 of 45 customers request new table. Phones come out before menus are opened. Waiters return a second time asking for order, customers ask for more time. Link to original transcript of study. Mobile is changing behavior in unexpected ways. While lingering customers are a problem, it can also be an opportunity. Realities of customer behavior may have new solutions. The restaurant could provide menus before customers are seated, and ask for orders earlier. Picture taking opens up opportunities for "from table" social media. Are food items presented in a "picture worthy" way? How do smartphones affect restaurant service? The mobile payments market place remains stuck on the wrong side of the chasm as consumers balk at mass adoption until the value proposition is clarified. The mobile payments arena continues to be characterized by a hodgepodge of players, each vying for the attention of merchants and consumers. In a classic chicken and egg scenario, consumers are vying away from payment options that can be used at a limited number of retailers while merchants are concerned with making an investment too early in the wrong technology. According to a PwC study on mobile phone payments, only 5% of consumers have adopted the technology. For any "Crossing the Chasm" fans, 5% is at the edge of the chasm, with penetration into new markets needed before the technology can move forward. It will be interesting to see which platform prevails including the wireless carrier solution called ISIS, Google Wallet, Apple Passbook, Square, Paypal many others. Retailers are also getting into the act with a payment consortium of their own. The key to all of this will be the ability of any of the players to develop a value proposition which emphasizes the ease and convenience of use, along with other potential benefits such as rewards or cash back. Other benefits will include a seamless integration of offers that enhance the buying experience at specific retailers such as incentives that are text messaged the moment a consumer walks into a store. Will Retailers Own Mobile Payments In The US? Two pieces of news came out this month on the state of the Chief Marketing Officer. First the good news... according to Advertising Age and Spencer Stuart, CMO tenure has more than doubled from 23 months to 45 months. Now the bad news. A new Accenture study claims that 4 in 10 Chief Marketing Officers say they do not have the right people, tools, and resources to meet their marketing objectives. So, research shows that there is a strong correlation between being unprepared and keeping your job; a real turn of events for marketers that prided themselves on being prepared as they were summarily fired. CMO's operate in a complex and accountable environment. Fortunately, all of this responsibility has contributed to a higher level of transparency and importance. Take Facebook as an example. The CEO can now touch the brand by visiting the Facebook page, by watching the Like counts grow and by reading posts that express the true relationship between consumers and the brand. It also demonstrates how the brand and the customer relationship are the responsibility of the entire enterprise, not just the CMO. If that isn't enough, measured media can draw a straight line between revenue and marketing driven sales contribution. In terms of CMO's feeling unprepared, this is a direct result of the need to improve operational effectiveness and test new marketing channels. The role of the CMO in aggregate hasn't changed much....to deliver and optimize workflows that make a measurable contribution to the business. What has changed dramatically is the number of marketing channels that require unique expertise and a technology investment, not to mention integration with existing systems. The challenge is to validate these channels within a time frame that doesn't test the patience of the Executive Team. With every new channel comes risk for the CMO due to required incremental resources on staff and technology. Unfortunately, while most marketers see a new channel as the equivalent of giving birth to a baby that requires care and upbringing, the CFO views every channel as an adult that can be judged within the fiscal year. The result of all this is a drop of 5% in the number of CMOs that feel prepared vs. the 2011 Accenture study. Luckily, there is a solution to the CMO paradox of longevity and being unprepared. Firms like MMB Marketing Demand Systems are offering CMO's fully optimized workflows that can be immediately used to test new marketing channels at a fraction of the cost associated with building internal capabilities. 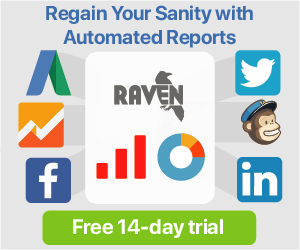 Marketing channels such as social, organic search (and content marketing), paid digital media and CRM can be tested using these types of solutions on a trial basis. Results can be used to justify an in-house investment, or to continue with an outsourced solution. This type of approach benefits the CMO in several ways including the ability to minimize the size of the internal marketing staff and technology investment while aligning marketing expenses with clear outcomes. It also protects the CMO from being associated with high internal staffing costs during times of organizational change. Answering questions and internal probes become a conversation around where investments were deployed and the associated results. The new world of the CMO is one where every new channel is tested and optimized outside of the enterprise. Without the burden of staff and technology, the CMO can be nimble in the way they turn on and off various initiatives. Internal costs never become an issue, while external investments are completely aligned with outcomes. This approach will not only help the CMO survive, but once again become prime candidates for CEO. According to Time Magazine students are more likely to remember where information is saved then to remember the information itself. Search is changing the nature of how we learn, how we think, and to all the organic search enthusiasts out there, how we write. Search is also a time capsule of our culture as depicted in this video on what we searched for in 2012. Whether you are a B to B or Consumer marketer, understanding how the principles of value capture marketing can be used to your advantage can be the difference between a successful program and one that fails to deliver the required ROI. For brands, this often stops at collecting clicks, views, impressions or shares. While these metrics have some value, they will constantly be challenged by those managers that will only buy into hard metrics such as revenue. The good news is that most marketing programs offer many opportunites to capture value. For example, when placing a video on YouTube, why not end the video with some type of incentive that will encourage the viewer to provide some identifiable information such as an email address. Why not go even further and offer a coupon that can measure purchase, then a reward for providing referrals, or anything else that provides a clear path for the consumer or prospect. In the case of B to B, a simple white paper is all it takes to move someone from anonymity to known. With each email collected, a brand is obtaining the name of a potential customer that at minimum showed interest in a particular product or service. Now let's say you collect 100,000 or 1,000,000 of these names. Would you rather have 1,000,000 "Likes" or 1,000,000 names. erest in the brand. As Gina Sverdlov notes in the Forrester research blog, their "Facebook Factor" research shows that individuals that "Like" a brand are significantly more likely to purchase. Now what if these "Likes" are incented to download a coupon, or take some other action that identifies them as brand interested. Any incentive such as loyalty points, coupons, books, virtual currently etc. can work to engage with this self selected audience to yield greater value for the brand. Determining how to capture and increase the yield from value captured from a succession of customer interactions is sure to increase the batting average of any marketer. Value capture marketing promises to transform programs that traditionally rely on soft metrics such as Likes and Views to one that delivers real measurable value to marketers. As marketers, we often rely more on instinct and perceptions of experience than rational thought. Marketers justify this type of decision making by convincing ourselves that when predicting the future, it's difficult to use the past or historical fact. Analysts on the other hand use historical fact and data as the only basis for decision making. They introduce a bias that often causes organizations to not see what is happening around them. This is how companies such as Folger's Coffee miss dramatic changes in a market, such as the coffee revolution sparked by a company like Starbucks. In the book "Thinking Fast and Slow" , Daniel Kehneman demonstrates how bias influences decision making and how our minds are subject to systematic errors. As we all understand, but rarely consider, intuitive preferences consistently violate the rules of rationale choice. For example, if you like Ford cars, are you more likely to purchase Ford Stock, even if the stock isn't the best rational choice? 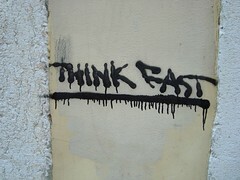 The notion of "Thinking Fast and Slow" refers to two systems in the mind, system 1 and 2. System 1 operates quickly without voluntary control, while system 2 are subject to the amount of concentration and reasoning you apply to a problem. For example, the author points our that system 2 applies to what we think of ourselves, while system 1 is the snap judgement we make when viewing others. Another example is the bias to act on an immediate emotional reaction, even when you are manipulated, instead of assuming or understanding that in fact you were manipulated into a decision, resulting in an error of judgement. "We can be blind to the obvious, and we can be also blind to our blindness"
The book also explores the two dimensions of ourselves, the experiencing self, and the remembering self, which as noted by the writer, "do not have the same interests." For example, "what makes the experiencing self happy, may not make the remembering self happy." Another important point is that we are much better at recognizing mistakes in others, than spotting errors of judgement made by ourselves. "Thinking Fast and Slow " is helpful in developing a higher degree of self awareness and promises to have a positive direct effect on your ability to formulate and execute marketing programs. I've been a bit remiss in providing some thoughts and highlights coming out of Affilate Summit West 2012 (January 8 - 10 in Las Vegas). For those not familiar with the Summit, it's a biannual conference where performance marketers (translation: people that actually do the work to directly earn money that pays the mortgage) get together to share thoughts, ideas and to get a general sense of where we are all heading. Everyone in attendance uses a different approach, but all are centered around new models for lead generation, conversion and retention. As was the case at past Summits, we are at yet another inflection point in marketing where the tactics of the past are giving way to opportunities created by the communications channels of the next 12 months. Each channel alone and in combination offers an infinite number of possible communications and revenue models that can be leveraged via either a highly focused or broad based multi-channel approach. As is always the case in marketing, those that take the time to learn faster, and then act with a test, read and role mentality can win, while those that cling to older models are destined to fail. Of course, the other benefit of going to Summit is to learn about new networks and tools that can be placed into your CPA, CPC, PPC, SEO, Social Media and any other toolbox. This includes some innovative work being done by Sterkly, a company that is offering an interesting combination of software and affiliate offers that work alongside popular destination sites such as YouTube. There were also great presentations by Vinny O'Hare on that state of SEO, Robert Adler on link building and the famous Jeremy Schoemaker who provided an insightful keynote on the potential of the performance industry. Affiliate Summit West was a sellout for good reason and it's why the upcoming Affiliate Summit East conference scheduled for August 12-14, 2012 will be even bigger. I'm going to place a bet right here, right now that the breakout web content property of the year is going to be the AOL owned Patch.com. Patch what might you ask. Patch.com is comprised of local sites, edited by professional writers, who pull together local news on the town or village level (population size 15 - 100K) For example, there was a traffic accident on the road in front of my house in the 36,000 resident village of Plainview, N.Y.. The Plainview Patch had pictures, a well written description and details on what occurred. In fact, only Patch covered the accident. The same for the gas leak in the local Chinese restaurant and coverage of various events around town. The coverage was high quality, appeared quickly after the event happened and provided just enough detail to keep you interested. When my wife opens her AOL, the Patch screams the news of the neighborhood. Literally our neighborhood, as in down the block. While I can't speak to the economics of this hyper local coverage, it's incredibly addictive. After all, once you get past world news, national news etc, what you really care about is what's happening in your little corner of the world. In an era where any writer can carry a quality camera, Patch reporters are defining the future of journalism. It's local, it's next door and it's high quality. Patch.com will be the content phenomenon of the next 12 months. With 50% of all advertising revenues considered to be local, the Patch is going to grow quickly. Huffington Post and Yahoo move aside, the Patch is where the action is and it's the start of where AOL will rebuild their content franchise. Concentrate your energy and will on the elements of the project that you have influence on, ignore external events that you can't avoid or change. When you fail (and you will) be clear about it, call it by name and outline specifically what you learned so you won't make the same mistake twice. People who blame others for failure will never be good at failing, because they've never done it.